One of the first adjustments a farmer or rancher makes in light of tight financial conditions is holding off on farm capital expenditures. By running their equipment longer or using their building for a few more seasons, farmers can often defer capital investment in tough times. Because of this, capital expenditures are an important financial metric to track and observe. This week we are taking a look at the USDA’s latest estimates for farm capital expenditures. 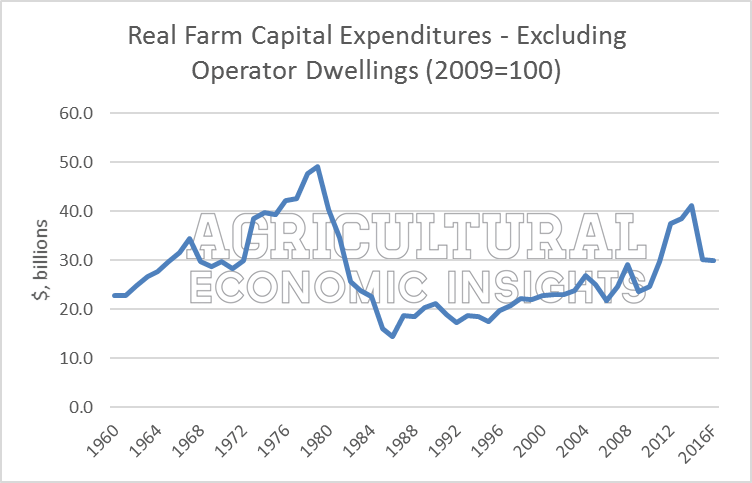 In figure 1, farm capital expenditures – excluding operator dwellings – from 1960 to 2016 are shown in real terms (or inflation adjusted). The USDA recently forecast real farm capital expenditures in 2016 at nearly $30 billion (2009 dollars; $33.3 billion nominally). The current 2016 estimate is nearly unchanged from 2015 levels. Both of these years represent a sharp contraction from highs reached in 2014, when real farm capital expenditures reached $41.2 billion as net farm income began to soften (net farm income peaked in 2013). Figure 1. Real Farm Capital Expenditures (2009 USD), 1960-2016F. From 2014 to 2015, farm capital expenditures contracted 26% (nominal values). How does this stack up to historic contractions? 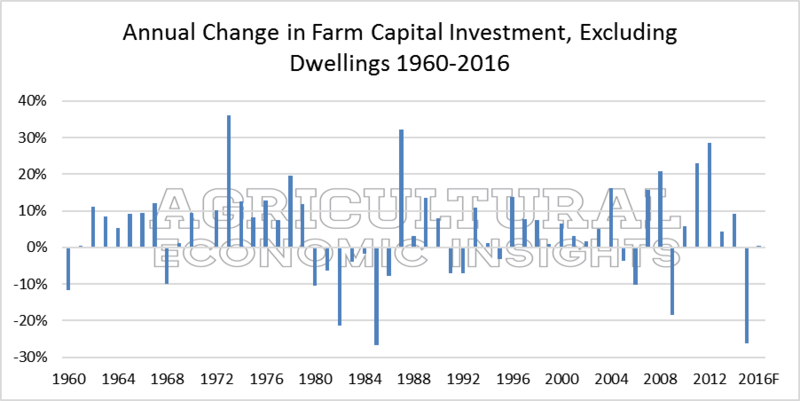 In figure 2, the annual change in farm capital expenditures is shown (excluding operator dwellings) from 1960 to 2016. At an annual change of nearly 27%, the contraction in 1985 was only slightly more intense than 2015. It’s worth noting, however, that the record decline in 1984 came after five years of contraction. In the most recent contraction, the large drop was the first year of decline. In fact, the decline in capital expenditures in the 1970s/1980s was persistent, lasting 7 years. Figure 2. Annual Percentage Changes in U.S. Farm Capital Expenditures, 1960 – 2016F (nominal). Data Source: USDA ERS. In addition to the total estimates, the USDA also provides estimates of farm capital expenditures by category. The category breakdowns are available as recent as 2015 and changes from 2014 to 2015 are shown in figure 3. For vehicles and machinery – tractors, trucks, automobiles, and other machinery – changes ranged from -25% for automobiles to -32% for ‘other machinery.’ Overall, vehicle and machinery expenditures down significantly and across the board. The other main categories of capital expenditures – buildings and land improvements – were both 16% lower in 2015. At this point, it seems building and land improvement expenditures have been slower to contract. Figure 3. 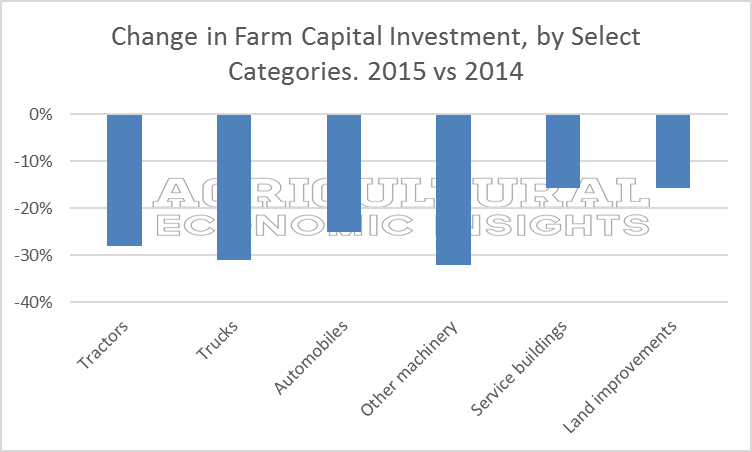 Change in Farm Capital Expenditure for Select Categories, 2015 vs 2014. Data Source: USDA ERS. A natural question when considering these data is what a “normal” level of farm capital expenditures might be. Real capital expenditures have been on an upward trend since the late 1980s (figure 1) making a “normal” level difficult to define. However, from 1990 to 2003 real farm capital expenditures were fairly stable at a period average of $20.1 billion (ranging from $17.3 billion to $23.7 billion). Current real capital expenditures ($29.9 billion) is still considerably greater than these prior “normal” levels. More precisely, a return to 1990-2003 levels would be a 31% decline from current 2016 levels and a 50% drop from the highs reached in 2014.